Spelling. Are you looking for Lorelai? What does Virelai mean as a name of something? [historical] A medieval poetic form consisting of two or more three line units in each stanza, in the form aabaab... and continuing on in that pattern. Virelai is a musical group. albums: "Danser duggen af jorden", "Havmandens kys", "Fra bølger og bjerge"
"Virelai" is a composition that was nominated for the Best Classical Composition in the 1992 Juno Awards. 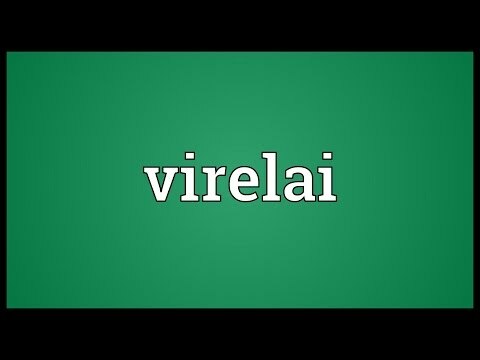 Virelai: A virelai is a form of medieval French verse used often in poetry and music. It is one of the three formes fixes and was one of the most common verse forms set to music in Europe from the late thirteenth to the fifteenth centuries. Oxford: Blackwell Press, 1993 Fred Porcheddu VIRELAI ( VIRELAY) The virelai is a fixed verse form established VERNACULAR 449. The virelai has the pattern of AbbaA; the A section acts as a refrain, and the bba stanzas feature alternate music in the b sections and the same music (but different words) in the a sections. virtuosic. Adjective that means “like a virtuoso. See also the blanagrams of Virelai! Go to the wordplay of Virelai for some fun with words!